Shinedown fans, we’ve got some epic news for you!! 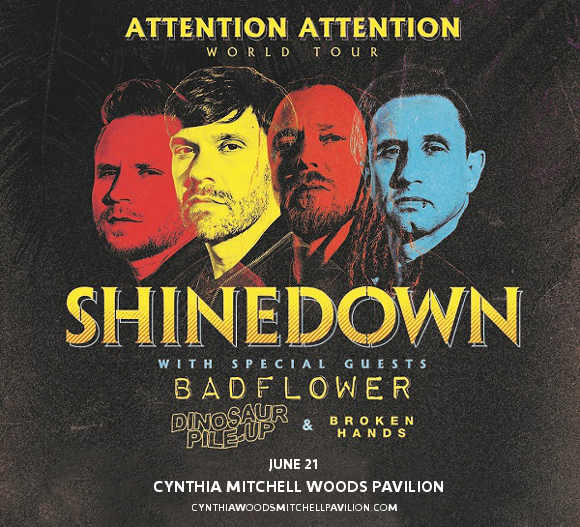 Your favorite band are on tour in 2019, with their brand new album “Attention Attention.” With support from Badflower, Dinosaur Pile-Up, and Broken Hands, they’re headed to the Cynthia Woods Mitchell Pavilion on Friday 21st June 2019 – are you ready to be singing along in that crowd?? Get your tickets now, while they last!! Now, it’s time to hear all the new sounds from Shinedown in person. What are you waiting for?? Those tickets aren’t going to last – get them while you can! !